The San Francisco 49ers are one of the most prestigious franchises in the history of the NFL as well as being one of the most successful. The 49ers have won 5 Super Bowl titles and have made 24 playoff appearances. Beginning at Kezar Stadium in 1946, they moved to their current home, Candlestick Park, in 1971 and plan on moving again in 2014 to Santa Clara into their new stadium called “New 49ers Stadium.” With a myriad of distinguished players having worn the Scarlet and Gold, these are, in our opinion the greatest 49ers of all time. Taken with the 8th overall pick in the 1981 NFL Draft, Ronnie Lott was perhaps the most feared defender in football history. In his first season he had 7 interceptions and helped lead the 49ers to a win in Super Bowl XVI. He would continue this type of play for San Francisco, playing both cornerback and safety at different times, and in 10 seasons helped the 49ers to win 4 Super Bowl titles. Lott was a 10-time Pro Bowl selection and a member of the all-decade teams for both the 80’s and 90’s. Ronnie Lott was inducted into the Pro Football Hall of Fame in 2000. One of the greatest quarterbacks of all time, Steve Young finishes in third because both players in front of him are widely considered to be the greatest football players ever. Young began his NFL career with the Tampa Bay Buccaneers and after under achieving, he was traded to the 49ers in 1987. Young was a back up for his first three seasons; however in 1991, Young took over the permanent starting job that he maintained until retiring in 1999. He was a 3-time Super Bowl champion, twice the AP NFL MVP and the MVP of Super Bowl XXIX. Upon retiring, he held (and continues to hold) the record for highest QB rating at 96.8 and 6 touchdown passes in a Super Bowl game. It is always hard to not have a 1 and 1a for this specific franchise due to Montana and Jerry Rice’s phenomenal careers. However, Montana is regarded in some circles as the greatest football player of all time; and it’s hard to argue. He was twice the NFL MVP, a 4 time Super Bowl champion, 3 time Super Bowl MVP and perhaps the greatest winner to ever grace the football field. 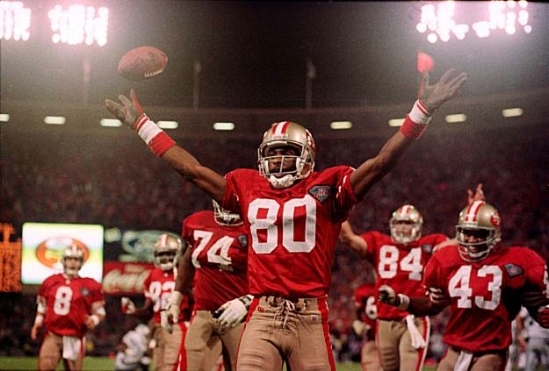 The “GOAT” (Greatest Of All Time), Jerry Rice holds almost every NFL receiving record. He totaled 1,549 receptions, 22,895 receiving yards and 208 touchdowns in his illustrious career to go along with 3 Super Bowl titles, 13 Pro Bowl selections and the Super Bowl XXIII MVP award. His 208 touchdowns scored are the most among any player in NFL history. He was known for being the hardest working player whether it was on the practice field, the offseason, or of course, the ‘big game.’ He was inducted into the Pro Football Hall of Fame in 2010. 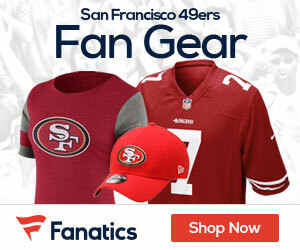 For more information, updates and unbeatable deals on 49ers tickets, visit www.AllArenaSeats.com today! Be the first to comment on "Top Five San Francisco 49’ers Legends"